It’s time friends. Time to pen the story of how I managed to bamboozle my way to the top tables of a yugioh regional and actually receive my first top 8 win. Disclaimer: While I took notes during the regional, I can’t give the innate play by play for each game. I’ll try to put whatever I can remember from skimming my match notes though. Game 1: I went first, was able to establish a board and beat him taking no damage. I used Apocalypse to destroy his Borreload and then defeated him. Game 1: I won the die-roll and my opponent could not out my turn 1 board. I rode that advantage to victory. Game 2: My opponent bricked. I had the weird scenario of Ignis on board with a set Chalice and some other bluff as he went for Black Rose Dragon. I could Chalice the Black Rose, but then it would kill Ignis so I let my board go. I then rebuilt faster than him to win the match. I gave him an MTG sleeve for his field center (A foil Gohan card from the Dragon Ball Super card game) since he was very crestfallen after the match. I was late to this round because my friend and I were by the vendors. I apologized like 6 times over the course of the match for this. Game 1: I won the die roll, established a board with turn 1 Master Peace backed by Monarchs Erupt. He couldn’t break it and lost. GAME 2: HE GOES FIRST AND LITERALLY HAS THE MOST INSANE TURN 1 I’VE EVER SEEN IN MY LIFE! Off of Lonefire Blossom and double Charge of the Light Brigade he starts with double Psyframe-Lord Omega…. Saryuya Skull Dread, Borreload Dragon, Bujintei Amaterasu, Abyss Dweller with Fairy Tail Snow in grave loaded 3 times. In my standby phase he adds Ash Blossom to his hand with Amaterasu and activates Dweller on me…. I bait the Ash with Pot of Desires and then activate Card of Demise. I destroy his board and we actually played a grind game of him frantically trying to get Borreload back into his extra deck with Curious, the Lightsworn Dominion in order to out my Master Peace (which to his credit he did). He beat me in time causing the match to end in a draw. Game 1: This was my first mirror match in the tournament and it technically invalidates my clickbait title because he did destroy me game 1. Game 2: I was able to keep him off Borreload by popping his Scapegoat tokens with Master Peace winning the game. Game 3: Once again the heart of the cards and turboing out Master Peace before he did won me the match. Game 1: I was caught by the Mekk Knight monsters (as they a new archetype not used in the anime so I didn’t know what they did). Luckily, playing around Mekk Knights just came naturally after his first turn so I never put a card in the same column again. We played a back and forth game. Eventually, he made Borreload to out my Master Peace, but realized after the fact that my MP has 3250 attack so he had to link his Borreload into a Decode Talker along with Invoked Elysium and Purgatrio to get over it. Luckily, I had a set Return to dodge lethal and I outed his board on the following turn narrowly winning the game. Game 2: We went into time, but he couldn’t out my MP and I was able to defeat him by dropping a second one. Game 1: My only Pendulum opponent of the day. I went first and was able to outgrind him by playing around his power traps with Return of the True Kings to revive the somehow too big, but effect-less Master Peace. Game 2: He gets me to 100 LP (I thought I was dead, but I did not realize that his Zefra guy had 0 atk!) but I manage to turn things around with another Master peace in order to win. So I had to play against my teammate, the creator of the deck and my friend. We had the exact same record and this round would ensure an invite for one of us. It was the hardest match emotionally that I had to play. Game 1: Won the dieroll, got turn 1 Master Peace and he couldn’t out it. Game 2: He makes double Master Peace quickly, but I out one with Raigeki. I out the second by crashing my own MP with his after baiting its effect. We started topdecking due to Anti-Spell and the match-up came down to me destroying his set Card of Demise whereas he destroyed my set Chalice off of Disciples being popped. Game 1: I won the dieroll and created a great turn one board with MP (I’m getting tired sorry) and Maiden. He started trying to out it, BUT THEN WE GOT A RE-PAIRING. Game 1 (Again): I win the dieroll and go second. He grinded back and forth and I narrowly beat him thanks to some luckily draws off Disciples. Game 2: We go into time and he beats me ending our long bout in a draw. By this point the venue has “technically” closed since the organizers made the poor decision of only booking it until 9pm. The judges were chasing people out of the venue while we played the last round. Game 1: My opponent outs my turn 1 board of Maiden + Monarchs Erupt using Mind Control. He then fuses her into Invoked Raijin, but did not deal me very much damage. I messed up though and lost my Spell/Trap MP to a Ghost Ogre. Luckily, Apocalypse destroyed his Mechaba preventing him from defeating me. I then ran over his 500 attack Aleister with Maiden on the following turn for game. I want to thank my friends at Penn Duelists, Drexel Duelists, Jack and most importantly Sir Emanon (who also got 28th place securing his own invite) for all of their support. Once again here is the Deck Profile video with Sir Emanon on his channel. and the Deck Profile video on Card Overflow. I want to apologize for not posting for an entire month and ignoring three whole ban lists! 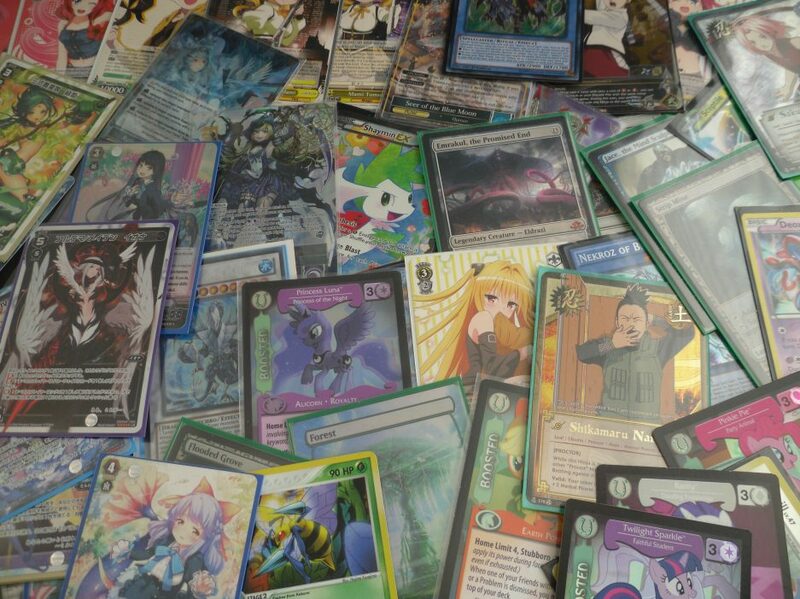 (Ygo TCG, Ygo OCG and MTG Modern…). I got very much sucked into the phone game world after realizing that the “gatcha” is essentially a box of packs you can open whenever you want on your phone. That being said I had many opinions on the recent banlists (RIP MAXX “C”, Bugger off Jace, TMS), but not enough to actually make a post. Now on a whim my playgroup created a “team war” for the upcoming Philadelphia regional. The condition was that whichever group of players did worse overall would have to purchase dinner for the winning team. For some reason this made me decide to actually buy into a meta relevant Yugioh deck for the first time since 2016 ABCs. I bought the True Draco deck core for roughly $250 back on May 16th. One of my friends loaned me the Card of Demises (which go for around $30 apiece, making the whole deck $350 give or take some deals). It was then another of my friends recommended we go to a regional in Timonium, Maryland to get our coveted invites before Philly. Not expecting much I decided to go as a chance to playtest the deck that I literally started playing 2 days before the regional. As luck (and the clickbait title) would have it, this deck performed amazingly. I was able to go 7-0-2 at the Maryland Regional on 3/25 only once going into Game 3. I owe the creation of this deck to my personal friend and Yugituber Sir Emanon and our friend Jack who spent a month playtesting and theorycrafting the list. My only playtesting before the regional were playing against Emanon and another friend with Pendulum Magicians. I’m going to break this into two blog posts. The rest of this post will be a deck profile and a second blog post will be a full tournament report. DISCLAIMER: I did not build this deck. I was given the list by Sir Emanon and can only give my impressions of each card based on my short term experience with the deck. Also I did a deck profile with Sir Emanon on YouTube here and on Card Overflow here. Without a doubt the win condition of the deck. Every time I was able to summon Master Peace it forced my opponents into a sub-game of struggling to out it. This is one of the strongest boss monsters I’ve ever seen. Due to combo-focused meta of modern Yugioh not every deck plays an out to Master Peace for each possible configuration which leaves many decks with 1-2 outs. Furthermore, the pressure that Master Peace puts on your opponent will seal the game in short order if he sticks around for more than a turn (provided you have ammo in the graveyard for his quick effect). 2 copies was great. I never banished both off desires and only drew 2 one game. Master Peace is honestly ban-worthy. Ignis is limited for good reason. The True Draco spells provide amazing card advantage and as a result access them had to be hindered. While he was not as good as Master Peace, Ignis was never bad. Maiden at 3 was absolutely fine. You need a monster in order to start outing your opponent’s board and Maiden provides both a quick pop off the True Draco s/t, but also searches Master Peace. I only opened double Maiden twice all day and it was not even an issue. MVP of the deck. If Master Peace is the sword, Amano is the shield. This $0.10 common enables you to out boards that took your opponent 10 minutes to build. You just normal Amano going 2nd and then go to the races chaining draw spells, making a board and in the process destroying your opponent’s set-up. I loved this card. Diagram does everything. Literally everything. There is no more important a card in the deck. I am certain that this card (or Master Peace) will be banned within a few months. Both of the spells allow Amano to function by allowing an additional Tribute Summon on your own turn. Heritage provides impressive draw power and removal. It’s also insane in the mirror match. This card pretty much helps you grind out your opponents by recycling your threats and providing even more draw power. Card was amazing all day. Easily the best draw spell in the deck. The thing about this deck that’s so strong is that Card of Demise draws you into more draw cards or cards that help you empty your hand before the end phase. Also Amano-Iwato synergizes with Demise like Yosenjus did, allowing you resolve Demise before Amano to avoid discarding him. This card was amazing at digging for combo cards. I only opened 2 copies once all day. Absolutely incredible and a great help. Ok so full disclosure, Desires was my least favorite draw spell. It never bricked me or ruined me, but the variance it puts on the grind game is stressful. I would NOT cut it, but I tried my best to have Return/Master Peace searched out before playing it. This was Sir Emanon’s tech choice for the deck. It came almost completely from a desire to combat Abyss Dweller going second, but honestly it was never a bad card. This was an out to opposing Master Peaces, and was reasonable going both first and second. I believe Chalice was very solid. This is quite possibly the strongest card in the grind game. No deck can reasonably deal with a 2950 def monster coming back every turn. I fully understand why this is limited to one. It’s busted both conceptually and in practice. This card provides the basic spot removal in the deck. It also does insane things by halving opposing monster’s stats. This card was amazing all day. Skill Drain needs no introduction. It’s been limited for years due to its ability to destroy the most pushed part of Yugioh: Effect Monsters. I only got to resolve it twice all day, but it was very strong. This card was mained to combat Pendulum Magicians which was the perceived best deck of the format at the time. It was also ok in the mirror match going first, but it was also very easy to destroy. It stalled the game out though and helped me to outgrind a few opponents. So we played no extra deck and ran Monarchs Erupt. This card was amazing in every match-up, but the mirror where it was dead. That being said any game where it stuck it quickly took over the game. This was the final lock piece to protect our board. Jack sided it for going first, but I never had a problem with it. Judgment saved my board twice. I did side it out going second in game 2 though. I never sided this in. I never needed or wanted to side this in. While I love the meme, this card was effectively useless. I never sided this either. I planned to side this going first game 3 against Invoked, ABC and Pendulums, but that never came up all day. I don’t think this card is wrong, but it never came up. An additional Anti-Spell for going first. Both of these were sided to combat opposing Master Peaces. Since Master Peace in the mirror is optimally Master/Trap so you need Spell outs for their Master Peace which is where these good ol’ boys come in. This card was very strong going second. We did not main-deck it because it conflicts with Demise going first. This card is really good and can see why people maindeck it though. This card is insane in the mirror match. I would add a 3rd. It was very good. While this conflicted with Master Peace, the pressure it put on the opponent was worth it. Now with all that finally said, I’ll get into my tournament report.